Hey Dexter fans, did you notice the Sabre printer that appeared in last night’s episode, ‘The Angel of Death’? That is funny ridiculous! I don’t watch that show. Is there any crossover in production staff that would account for the “shout out”? Or is someone on their staff just a fan? Well it makes sense. Sabre is a Tallahassee based company and Dexter works in Miami. That’s HILARIOUS! The TV world is its own reality! What next? 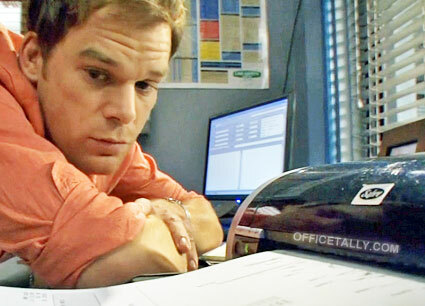 Will Dexter show up unexpectedly at Dunder-Mifflin? Could HE be the Scranton Strangler!?! I didn’t notice this at first, but I saw it on reddit last night after watching Dexter. Absolutely awesome! My two favorite shows, coming together. This is why I love Tallyheads; I can always count on your collective eagle eyes! Careful Dex… Those catch on fire!! my 2 current favorite shows, that is awesome! That’s funny! I didn’t even notice that while watching the show. @6 Was just thinking that!! That would be soo funny if he showed up as the scranton strangler! Haha, it would be completely surreal if they did a crossover, where characters from the Office showed up in Miami…maybe for a convention? Anyway it’s good to see The Office going strong and still leaving its mark. Michael C. Hall was on Six Feet Under with Rainn Wilson who was in America’s Sweethearts with Julia Roberts who was in Flatliners with Kevin Bacon.